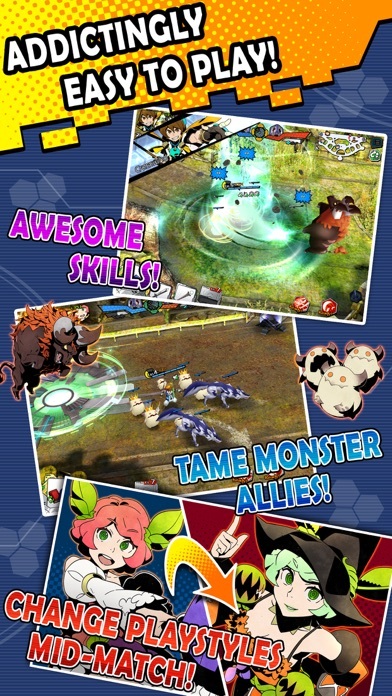 FLAME VERSUS BLAZE By SQUARE ENIX INC for Android/iOS (iPhone/iPad). FLAME VS BLAZE Tip #1: Basic Attacks and Skills. Tap on an enemy once to automatically run toward them and start using basic attacks automatically when in range. Basic attacks are strengthened by Power bonuses. Soul Mode and Travel Mode agents can strengthen their basic attacks with sould bonuses as well. Skills are unlocked after reaching certain levels in a match. You can use a skill by tapping it's button in the bottom right of the screen. After using a skill you must wait some time before you can use that skill again. FLAME VS BLAZE Tip #2: Different skills have different activation behaviors. 1. Direction Based: Upon tapping the skill button the agent's skill will activate in the direction they are facing. 2. Enemy Based: Upon tapping the skill button, the agent's skill will activate on the currently targeted or the nereast enemy within range. 3. Prompt Bases: After tapping the skill button, you must tap again on the field to activate the skill in the seleced location. -> You can cancel the second step by tapping on the skill button instead of tapping on the field at the expense of some of the skill's cooldown. -> Skill strength is generally affected by both Power and Soul bonuses. Some skills are affected by more by power, and some skills are affected more by soul. However, secondary effects like ailments are affected primarily by soul. FLAME VS BLAZE Tip #3: Leveling Advanced. Defeat monsters to earn experience points in order to level up your agent. Monsters defeated by nearby allies will give you experience points as well. Level up to unlock your character's skills and card effects. Mode Shift can be used from level 3 with some exceptions. Enemies defeated by your allied monsters give you experience points as well. You can level up early on by allying with monsters that focus on attacking enemy Manaplants, like Buffleyak and Bufflemare. Monsters allied with the enemy team yield more experience points that neutral monsters. When you defeat an enemy agent you will get experience points from their allied monsters. FLAME VS BLAZE Tip #4: Recovering HP. Cards become active upon reaching specific levels a match. Each card has variety of different card effects. There are three types of card effect activation requirements. 1. Automatic: The card effect becomes active automatically once the card is active. 2. Tap-Based: The card effect becomes active for a limited time upon tapping the card at which point a graphic will appear over the agent's head. There is a cooldown before you can tap the card again. 3. Trigger-Based: The card effect becomes active when fulfilling a specific requirement during a match at which point the card will glow. -> Stand Still to recover HP slightly faster. -> Stand in your team's base to recover HP rapidly. There are other ways to recover HP as well. -> Some agents like Dahlia and Grace have skills that can recover HP for themselves and/or teammates. -> Some card can be tapped to recover HP. FLAME VS BLAZE Tip #5: Reviving. When an agent is defeated they will revive at their base after 10 seconds. Upon being defeated an agent will drop a fixed amount of small mana based on their current level and the amount of mana collected since the last time they revived.